It’s up early for your light aircraft flight to Sossusvlei from Namibia’s capital city of Windhoek. This afternoon, we’re going to be treated to an aerial view of the iconic dunes of Sossusvlei, but we’ll be back there early tomorrow morning – the best time – for a guided nature walk. World-famous Sossusvlei is an enormous clay plan, flanked by the famous sand dunes that stand out starkly against the blue sky and flush red in the early morning sun. These towering dunes have developed over millions of years, the wind continuously transforming the contours of this sea of red sand. The ‘vlei’ itself only fills after rare, heavy rainfalls when, in a complete turnaround, it becomes a spectacular turquoise lake. Today, we take to the skies. 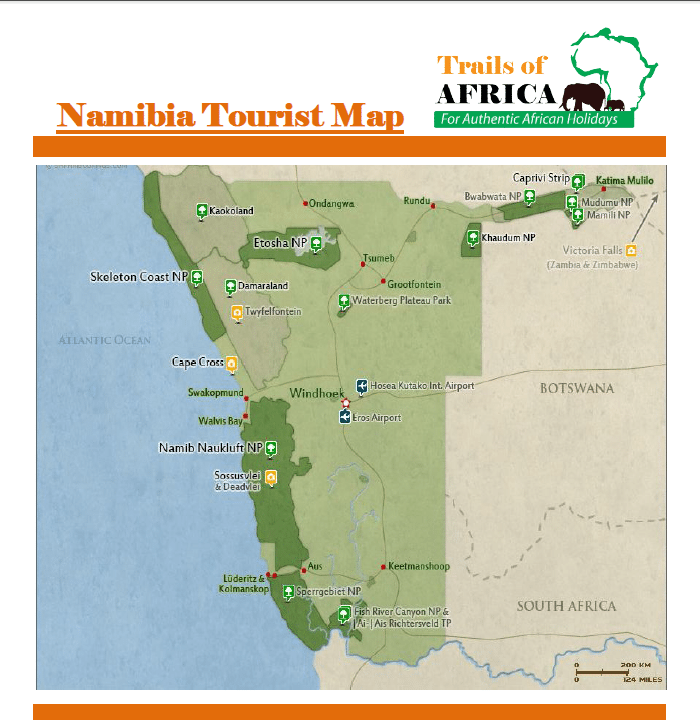 We soar over the dunes of the Namib desert and Sossusvlei, continuing westward to the Atlantic Coast to the quaint seaside village of Swakopmund. We’ve two nights here so, as a suggestion, get your tickets for a dolphin cruise in Walvis Bay and get up close and personal with the birds, seal colonies and numerous dolphins that inhabit this area. Our air transfer this morning is a wonderful visual tour from on high, of the legendary Skeleton Coast, affording awe-inspiring bird’seye vistas of this desolate landscape with its array of ship wrecks. From there, we turn inland to the rocky arid desertof Damaraland, home to the unique desert-adapted elephant. We follow the line of the Skeleton Coast, and if luck’s on our side, enjoy extraordinary aerial views of elephant, gemsbok, springbok and, occasionally, a glimpse of the endangered black rhino. And then it’s destination Etosha, Namibia’s premier wildlife destination. We fly there by light aircraft for our two-night stay, and after settling in to our accommodation, set out to explore this strangely bleak wilderness, teeming with wildlife. In the dry season, large herds congregate around the waterholes, while in the summer, sporadic rainfall produces a profusion of new life. Game viewing in this wild, often startlingly beautiful barren region is world renowned, and you won’t be disappointed. In the heart of the Park, is the shimmering Etosha Pan, a shallow depression which fills with water in the rainy season. Mirages, glittering salt deposits, Big Five wildlife…all wonderful material for photographs and memories. Say farewell to the adventure as we return by light aircraft to Windhoek, arriving at approximately 4pm in the afternoon.